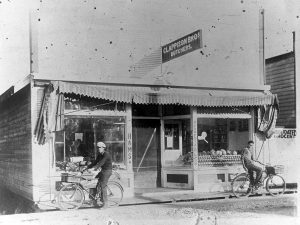 Two delivery boys on bikes in front of Clappison Bros. Butchers circa 1928. Bill and John (Jack) Clappison came to Haney from Yorkshire, England in 1928 to join their married sister, Mrs. Algie Bend, who was already living here. 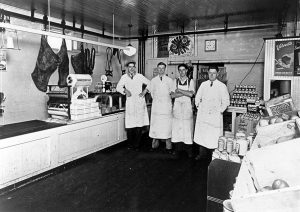 Not long after their arrival, they opened Clappison’s Meat Market on Ontario Street (224th). They delivered meat to homes using boys on bicycles and later, when their customer base was spread throughout the district, a fleet of three trucks. With the opening of grocery stores in the 1940s, the brothers ventured into different aspects of the food business. Jack started a cold storage business while still operating the meat market, and Bill started Clappison Packers, a slaughterhouse and wholesale meat business. Interior of Clappison Bros Butcher Shop in 1931-32. Left to Right is Ernie Zeron, John Clappison, Jack Reid, and William Clappison. Bill served on the municipal council from 1949-1951 and was also chairman of the Chamber of Commerce in 1946, during which time he lobbied for the removal of telephone charges for calls between Haney and Hammond. Bill married Ethel Lilley, member of another early settler family, and they had one daughter. Ethel was involved in the Green Valley Rebekah Lodge, an Oddfellows affiliate; as well as the Order of the Eastern Star, a women’s affiliate of the Masons; various church groups; and the Rotary Ann Club. Bill retired in 1975 and died in 1989 at age 82. Ethel died in 1993. 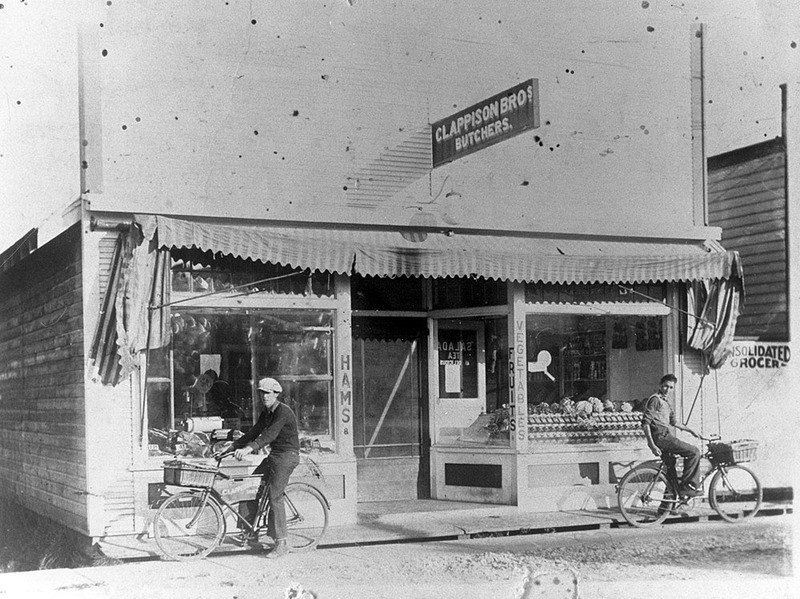 Clappison Packers, the business opened by Bill Clappison in the 1940s as the brothers diversified. Jack’s cold storage business was hurt due to the popularity of refrigerators and freezers, but he adapted and locally pioneered the use of plastic bags to store frozen fruits and vegetables. His company, Snowcrest Packers, thrived due to his innovation. Jack married Margaret Wilson in 1939 and they had two daughters. He was a member of the Masons Prince David Lodge for sixty years and was involved in the founding of the Rotary Club and a seniors’ discussion group. Jack died in 1997.